If you haven’t had a good mountainside pagoda experience, these two spots (with confusingly similar names) are some of the oldest and most historically important pagodas in Vietnam, reachable via an easy daytrip. 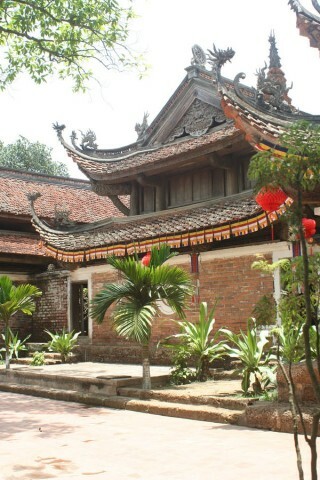 The first of the two, Chua Thay or ’Master’s Pagoda’, is about 19km from Hanoi. Just head southwest out of Hanoi on Duong Lang-Hoa Lac, take a right turn, go under the new flyover, and it’s about 2km to the village. The surrounding area features 16 hills jutting up from the farmland, likened to the body of a dragon jutting out from the sea. The largest hill is considered the head, and that’s where the 11th century Chua Thay is located. You’ll be greeted by a beautiful reflecting pond (Dragon Lake) featuring two bridges built in 1602, and a stage for water puppet shows, one of the oldest in Vietnam. At the end of the lake sits the main temple building, dedicated to a monk named Tu Dao Hanh who lived back in the 12th century. Inside three statues represent the monk in different forms. As you’re facing the temple, walk left towards the mountain to find the steps leading to the hilltop pagoda complex. It’s about a 50m vertical ascent, and once you hump up, you’ll find a collection of charming old buildings and shrines perched on the mountain, along with a natural cave shrine. The spot is a bit reminiscent of a mini Marble Mountain (located just to the south of Da Nang). A lot of complicated history and lore lies behind the shrines and the caves in the area, so if you really want all the info, try for a guided tour -- be sure to negotiate a price in advance. Even if you don’t care for the history lesson, it’s a pretty spot to visit. The next stop is Tay Phuong. Head back to Duong Lanh, turn right, and take a right about 5km further on. There’s no sign for the pagoda on the main road, but look out for one for Thach That, which is the district you are heading to (the village is called Yen). From there, it’s 10km to the temple, and signs lead the way. Once again, you’ll have to walk up a few hundred steps to the pagoda. Tay Phuong is a national treasure thanks to the phenomenal sculpture and art on display there. Most notable are the likenesses of monks rendered in lacquered jackfruit wood dating from the Tay Son period, just before the 1800s. These are a cut above a lot of pagoda sculpture in terms of subtlety and detail and seem to be even finer than the examples of the genre on display in the Fine Arts museum in Hanoi. In the central chamber of the pagoda, there’s a striking rendering of a ’1000-eyed, 1000-armed’ Bodhisattva, with a scintillating brass-coloured finish (though we wish someone would dust it now and again so it’d really scintillate). Behind that is a cluster of statues, at the centre of which is a very fine, very eerie ascetic monk. In the dimly lit area, he looks as if he might come to life at any moment. Again, hire a good guide to get the complete lowdown on the art and history of the spot, but even without a guide there’s plenty to see. Admission is 5,000 dong, hours 07:00 to 18:00 daily. The road through Yen village continues on towards Son Tay, so you can combine this pagoda tour with a trip to Ba Vi, though it’s a big day of sightseeing, so you might want to plan an overnight there.